Gaitor Challenge will kick off its spring season of free wellness walks from February 11th through March 25th, with the exception of March 4, between 5:30 and 7:30 p.m. on Monday nights. This is an excellent opportunity for any individual who seeks more physical activity and/or health education, and anyone who might benefit from encouragement and social support. 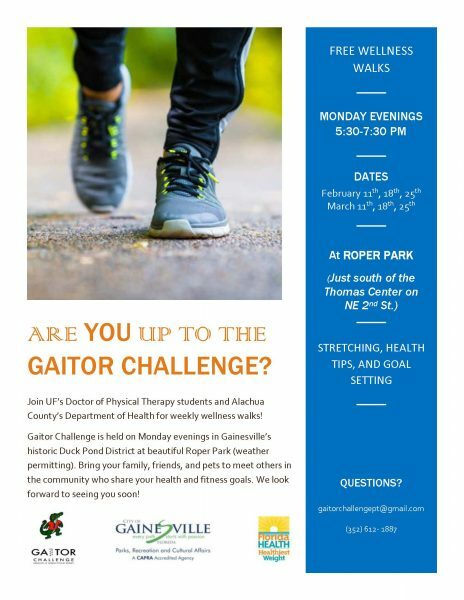 The wellness walks are located at Roper Park/Thomas Center in Gainesville and hosted by the UF Physical Therapy Students, who walk with the participants and help with goal setting. Participants are screened (blood pressure and a basic history) and then encouraged to join the group walking along the route. Exercise promotion, education about common health conditions and stretching programs are just a few things available to those who participate in the wellness walks. This is a great way to encourage participants to seek an active, healthy lifestyle and an important learning experience for the DPT students. If you have patients who you believe that will benefit from this program, please distribute the flyer below. This option may be especially useful for patients nearing discharge that would like more exercise as a way to keep up with their personal health goals. If you would like the Physical Therapy students to support them with their home exercises at the event they would be happy to do so!